COMMENT & ANALYSIS: Why were Dublin’s Luas red and green tram lines not linked together before the routes were first opened? The original decision by Government not to link the Luas red and green lines was made around 1998, years before the first tram started operating in 2004. The decision not to link the two light railway lines has become a running joke (and even a minor meme), but little is said about why the decision was made. The fact is: It would have displaced car traffic on a level that can only mean one of two options: (a) traffic reduction or (b) all traffic, including buses and trams, are left stuck in gridlock conditions. Government records show that, in 1998, the transport minister Mary O’Rourke lost a battle at Cabinet to join the two lines. Fast forward to 2017, after Government approval, construction to join the lines is well underway and the city is choosing the traffic reduction rather than the “traffic chaos” option. Below is a map showing some of the main traffic changes linked to Luas Cross City, including the main Luas works and changes and measures to support Luas and keep buses and trams moving. We’ve also included a less detailed outline of the Liffey Cycle Route and the future BRT route planned from UCD to Dublin 15 — the cycle route is over a year away at the very earliest, while the BRT route is likely to take at least a few years. MAP KEY: Red = main Luas works; yellow = Luas and College Green bus measures; green = Luas and bus priority measures on the quays; orange = Liffey Cycle Route; grey = future BRT. The Luas Cross City, which is a green line extension to Broombridge, will have a huge affect when it crosses the River Liffey northbound on O’Connell Bridge and go southbound at the Rosie Hackett Bridge — it will mean a tram crossing the river and stopping traffic on the north and south quays every 90 seconds. As we reported last week, the planned measures include access for buses/taxis/bicycles only on Eden Quay (between the two bridges Luas will use), so buses, trams and cars don’t all caught in gridlock. The problem is acute here because there isn’t enough space on the bridges to stop trams. So, the trams will always have to cross a bridge and both the north and south quays in one movement. Having shorter trams would mean a lower people-carrying capacity or more trams per hour to make up for the lower capacity per tram, which would stop traffic even more. Both are unattractive alternatives. 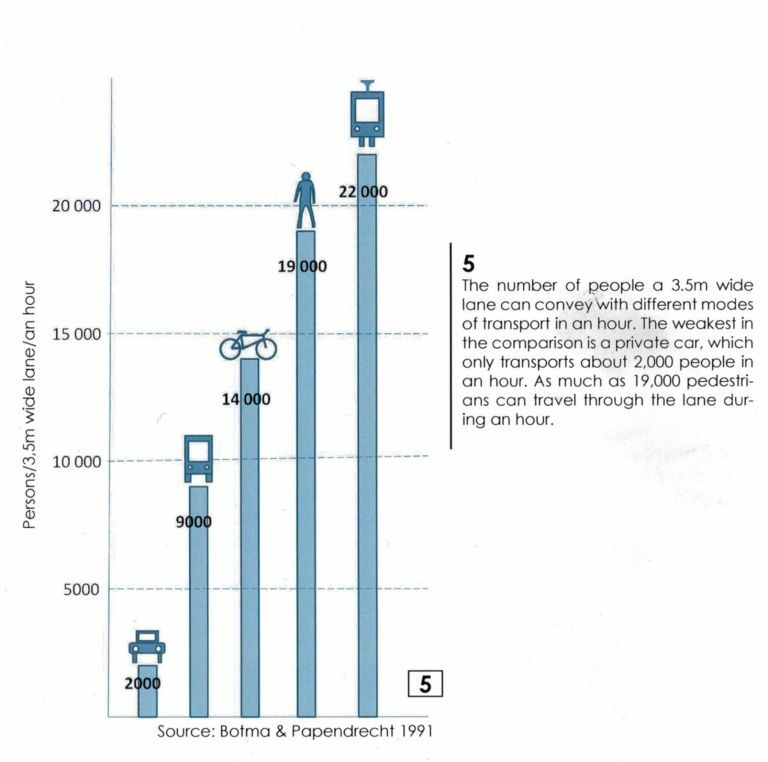 IMAGE: The number of people that can be carried in a 3.5 metre lane by mode of transport — cars take up the most space. But it’s not just the quays where there will be an impact: Luas Cross City deserves its name — it will cross many main roads and some of the most key junctions in the city centre. These include: Constitution Hill, Dorset St / Bolton St, Parnell St at Parnell Sq West, Parnell St at O’Connell St in two directions, Parnell St at Marlborough St, Townsend St as trams go onto College St, and College Green to Dawson St and onto St Stephen’s Green North. Bus routes will need to be detoured away from some of the tram route and buses will need priority if we don’t want them stuck in gridlock. Some of the key planned measures for buses include making Parliament Street and Eden Quay accessible only for buses, bicycles, taxis and very local access; turning two of the three traffic lanes on the Capel Street Bridge into bus lanes; new or extra bus lanes on the narrow central sections of the quays; and using one of the general three lanes on Winetavern Street and the O’Donovan Rossa Bridge as a bus lane. Two things provide for transport capacity — space and time (with urban surface transport, the time factor is mainly at junctions). Luas will take both of these things away from cars. It should be clear by now, but all of this will have a city centre-wide traffic reducing effect. This is why people and groups lobbied heavily against originally linking the tram lines. It’s why some people are fighting against planned measures to support Luas and keep buses moving planned for later this year. The city now needs to keep people moving and make its streets a more liveable place by providing for sustainable transport, which doesn’t take up the vast space used by cars. 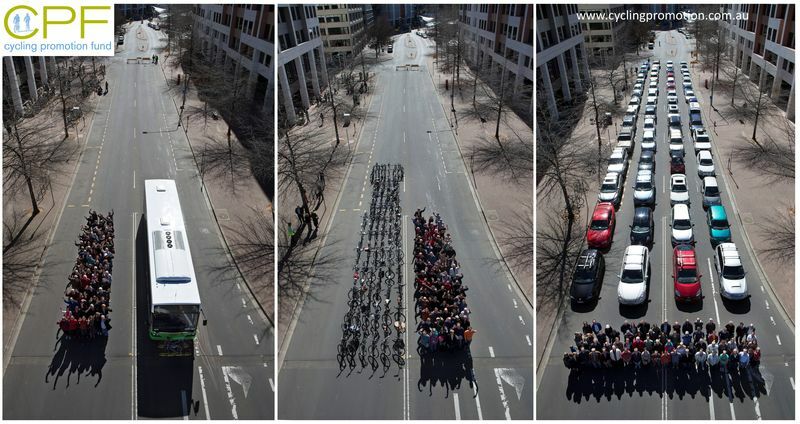 IMAGE: Space used by different modes of transport (see the second link below for disclaimer for images like this).